The country’s media sector is growing, but journalism remains a risk business. A recent report published by the New York-based Committee to Protect Journalists (CPJ) observed that the dividing line between politics and journalism is “more blurred than ever” in Bangladesh. The report identified nine countries, Bangladesh among them, as experiencing a decline in press freedoms. It noted that journalists in Bangladesh were “attacked from all sides” during the political turmoil of 2013. The report further pointed out the conflict dates back to the country’s secession from Pakistan in 1971. Although CPJ report’s raises serious concerns about freedom of the press, the media sector in Bangladesh has in fact evolved rapidly over the past ten years, with a large number of highly profitable newspaper and satellite TV channels. The country has benefited from considerable support from international aid organizations. Meanwhile, legislative changes, such as the Right to Information Act in 2009 appear to show the commitment of the current Awami League government to media freedom. This is a period of rapid development for Bangladesh’s media market, with many outlets enjoying both profitability and influence in an expanding market. Over the past decade, large privately owned Bangladeshi corporation have moved into the market and much of the national media is now in the hands of the biggest corporate groups in the country. In his book Media in Times of Crisis, Afsan Chowdhury observed that big business had captured much of the print-media space, and highlighted the fact that journalism in Bangladesh had become significantly tied in with other economic and business interests. Other critics have argued that the media has become increasing corporatized, owned by companies with roots in traditional business. Take, for example, the Transcom Group, which has interests in electronics, mobile phones, pharmaceuticals, food and beverages. It publishes the highest circulation Bengali paper, the Prothom Alo, and the largest English newspaper in Bangladesh, the Daily Star. It also owns the FM channel ABC Radio. This trend may indeed be contrary to a healthy media. According to a UNESCO report, “Cross media conglomeration has created an environment where creativity and diversity give way to standardization and a homogenised cultural environment.” It certainly has in Bangladesh; no matter which TV channel one watches, it is invariably the same programming format comprising a mix of low-quality drama serials, inane talk shows, and partisan, inaccurate news presentations. Still, it’s not all bad. TV channels in Bangladesh have flocked to embrace talk shows since the BBC World Service Trust Sanglap talk show was first broadcast in 2005. Some of these shows have played important roles in investigating issues such as corruption, policy reform, industry, and agriculture. The speedy growth of FM radio stations in Bangladesh has also been meeting demand among younger generations, especially in urban areas. These stations run a broad range of programs, including talk shows, music, general entertainment, and news. Community radio stations meanwhile play a role in communication for development, heightening grassroots awareness of different socioeconomic concerns. Fourteen community radio stations are currently on air, broadcasting a combined 120 hours of programming per day on areas such as agriculture, health, education, local and regional entertainment, and motivational programs. Nonetheless, there are threats to press freedom in Bangladesh. 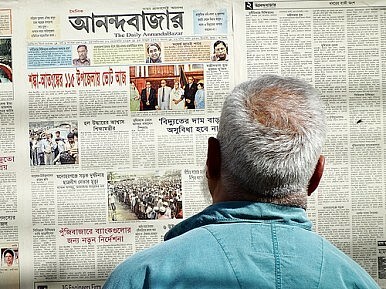 Inqilab, one of the nation’s oldest Bengali language newspapers was closed “temporarily” on January 16, after the daily reported that Indian troop had taken part in a crackdown in Sathkhira. The newspaper continues to be published online. Four journalists, including Ahmed Atiq, lead reporter of the story, were arrested at the Inqilab office. Journalists in Bangladesh believe that Inquilab is likely to face the same outcome as Amer Desh, another pro-opposition daily whose printing press was raided and sealed by police in April 2013 after arrest of its editor Mahmudur Rahman. Nor is broadcast media immune from government pressure. On May 6 , 2013 , the broadcast signal of Diganta Television was suspended on charges of broadcasting sensitive religious news and encouraging extremism. Media experts, especially broadcast industry insiders, are concerned about the draft national broadcasting policy. The proposal takes into account guidelines for broadcasting licensing along with advertisements and a section on the nature of programming. With 40 rules and regulations, covering 46 approved government and private television channels, the policy includes several clauses that demarcates boundaries that programming must not cross. It also strengthens the hand of the Information Ministry in decision making, including the issuing of broadcasting licenses. Clearly, the challenges for Bangladeshi media will continue.